How much is Cristie Kerr Worth? Cristie Kerr net worth: Cristie Kerr is an American professional golf player who has a net worth of $7 million dollars. 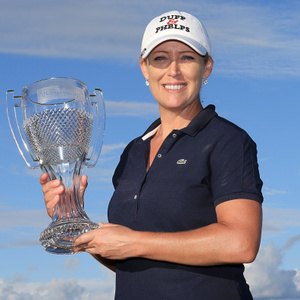 Cristie Kerr was born in Miami, Florida, and began playing golf when she was in elementary school. She excelled in junior level play, and won multiple amateur championships throughout the 90s. She was the 1995 American Junior Golf Association Junior Player of the Year. She won her first professional tournament in 1995, while still a junior player. She turned pro in 1996, and slowly worked her way up in the standings. She cracked the Top 50 in 1999, but it took her another three years before she actually won an LPGA tournament. Since then, she has played well consistently, and has racked up 22 professionals wins, 16 of them on the LPGA Tour. She has tied for second at both the Kraft Nabisco Championship and the Women's British Open, and she won the U.S. Women's Open in 2007, and the LPGA Championship in 2010. She has been ranked first in the world three times.